Even though you’re following the GAPS diet, you don’t need to say goodbye to some of your favorite foods. High-quality gelatin made from healthy animals can be a nutritional powerhouse, so you can happily indulge in a piece (or more!) of this sweet, fruity, jello. Blueberries are in season in many places right now, so here’s a great way to take advantage of the low prices and fresh taste! 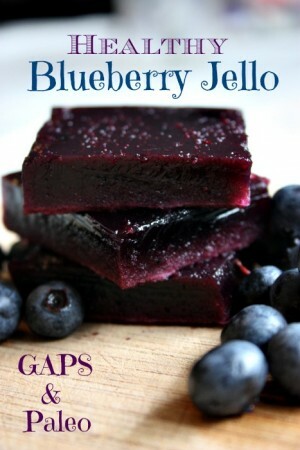 Recipe is from Hollywood Homestead’s Gelatin Secret book! 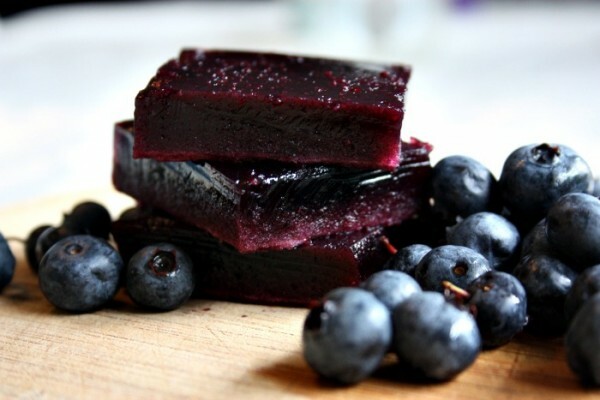 Check it out by clicking here, it’s a fantastic resource for gelatin recipes and how to include this awesome superfood into your diet. Boil water and blueberries in a medium-size saucepan. Remove from heat and puree with an immersion blender. Pour fruit mixture through a wire mesh strainer, using a spoon to stir it and coax all the juice to separate from the pulp. If desired, set aside the pulp to use in smoothies. Stir honey and lemon juice into the juice mixture then pour in gelatin. Use the blender to quickly but thoroughly mix gelatin into the fruit. Pour jello into an 8×8-inch glass baking dish or jello mold. Allow it to cool, then cover it and refrigerate for 2 hours or overnight. Wow! I have to get this book! I made the strawberry & lemon gummy gelatin for the 4th. I wanted something red, white and blue, so I also made some with coconut milk and some with blueberries. They were so delicious! I used frozen blueberries for the blue and just pureed them. I’m sure they would have been better if I had strained them. I’m sure this gelatin recipe will be delicious as well! I used frozen blueberries and they worked out just fine. I was kinda doubtful at first, till I made it. Not gonna lie, it taste quite delicious! Frozen bluberries did work fine. Thanks for the article! Gelatin can be high in glutamates, and some children on the spectrum are sensitive to glutamates (see the work of Amy Yasko), so proceed cautiously and observe for reactions after ingesting gelatin. Can xylitol and stevia be used instead of honey in Gelatin recipes? We can’t have anything that feeds Candida.